filed: December 4, 2012 • England, U.K. In the debate about wind farm development in Northumberland I have sat on the fence for too long. Once I had taken the decision to investigate the subject, my aim was to listen to the arguments for and against, then present readers with a balanced picture of this controversial issue. Now, after reading many reports and studies, and talking to people who have closely examined the impact that onshore wind turbines are having in this county, I have come to the inescapable conclusion that there is no justification for the continued approval of wind farms here in Northumberland or elsewhere. The evidence points to the fact that they DO enable developers and some landowners to make a lot of money at the expense of consumers, but they DO NOT contribute any significant reduction of CO2 emissions by reducing our dependence on fossil fuel- powered generators. If wind farm development is allowed to spread without restriction, it will be a growing blot on the landscape of a county which relies on tourism-related jobs. FOLLOWING the Kyoto Protocol of 1997, the UK government introduced, in 2002, a subsidy mechanism which encouraged investment in many renewable electricity generation technologies. The mechanism was called the Renewables Obligation, and it offered varyingly attractive financial rewards for investors, depending on the technology chosen. Its intended purpose was to lower greenhouse gas emissions by reducing our dependence on the fossil fuel-dominated power generation industry. However, the flaw with this particular subsidy was that the choice of renewable technology for investors was determined not by its effectiveness in actually reducing emissions, but by the availability of a quick return on capital. Wind energy was the out-and-out winner in this respect, in spite of its fundamental shortcomings in terms of unreliability and intermittency. These were quickly played down by the wind industry amid a surge of pro-wind spin. Pressure for renewable energy continued, and in 2007 a government study reported that in order to achieve the UK’s target of generating 20 per cent of total energy consumption from renewable sources by 2020, the widespread deployment of renewable electricity generating installations was critical. By August this year, 3,868 wind turbines were operating in the whole of the UK. Yet recently published data from the Renewable Energy Foundation about the fuel mix generating Great Britain’s electricity revealed two major trends over the last year. We have become increasingly dependent on coal to fuel electricity generation, and we are now importing more electricity from France and Holland. Figures produced by the Renewable Energy Foundation (REF) have shown that between April 2002 and February 2012 onshore wind power developers received subsidies of £2.4bn. The current annual subsidy being paid is £1bn annually, and by 2020 the annual subsidy could amount to £1.5bn. REF director Dr John Constable has calculated that a wind farm with 16 two-megawatt (MW) turbines would generate about 76,000 MWh (megawatt hours) of electrical energy per year and a subsidy of £3.8m. He said: “The basic wholesale price income for this electricity is roughly the same again, so total income would be £7.5m per year, about half of which is subsidy drawn from electricity consumers’ bills. A study carried out by wind farm consultants Entec, for Northumberland County Council, indicated that the county had ‘technical capacity’ for 17,000 MW of wind-generated power: equivalent to about 6,000 turbines. 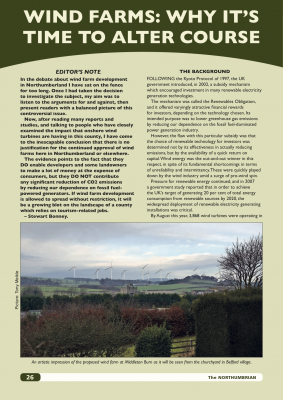 A highly critical response to this report came from the Northumberland and Newcastle Society, whose Environmental Policy Group commissioned a report from a leading planning consultant, a senior landscape architect and an expert on the health effects of wind turbines. A society spokesman said: “Apart from excluding nationally designated landscapes such as the national park, this study ignores landscape or visual issues. Where landscape, heritage or residential amenity issues are mentioned, they are seen as ‘challenges’ to the delivery of wind turbines rather than constraints or assets to be protected. Bill Short of Kirkwhelpington, a member of the society’s policy group and a business analyst who has made a technical analysis of Department of Energy and Climate Change data on energy generation and renewables, said: “Northumberland has approved almost 300 MW of renewable energy generation from onshore wind farms alone, yet only consumes an average 172 MW. So we have approved 170 per cent of our consumption compared to nine per cent in the whole of England. “When the wind farms under and awaiting construction are switched on, in proportion to usage and if the wind blows, Northumberland will make nine times more wind- generated electricity thanYorkshire and 67 times as much as the south east of England. “Earlier this year, the Energy Minister said we now have sufficient schemes in the planning system to meet our targets. We now have a situation where, across the UK when the wind blows, we have more renewable energy in the planning system than our average consumption – yet still we must have other generation to keep the lights on when the wind does not blow. Many of the wind farm developments under construction or in the planning pipeline will involve a new generation of giant 125m (410ft) turbines – THREE times taller than Grey’s Monument in Newcastle. One of the largest wind farms currently under construction at Middlemoor and Wandylaw near North Charlton, just to the west of the A1, will have 28 125m turbines. German and Spanish developers are now looking for other potential sites in this vicinity. On the Ray Estate near Knowesgate, consent has been given for one wind farm with 16 turbines. A proposal to develop a second site with 22 turbines was refused at public inquiry. Construction work was recently completed on an 18-turbine wind farm at Green Rigg near Ridsdale between the A696 and Sweethope Lough. When a transporter carrying a turbine tower to the site overturned on the A696 in May the accident caused a five-day road closure which cut off Otterburn village. The haulage contractor employed by the developer, EDF, has been required to pay compensation claims to local businesses for thousands of pounds of lost trade. At Barmoor work to build six 112m turbines is due to begin soon, and with other wind farms proposed near Belford (see below) fears have been expressed that the cumulative impact will be to dominate views from Holy Island and other popular tourist areas in the Northumberland Coast Area of Outstanding Natural Beauty. In the Belford area there are proposals to build 16 turbines, each 125m tall, at Middleton Burn – a site next to the St Cuthbert’s Way long-distance footpath – and a further nine 100m turbines at Belford Burn. Although German-owned developer Energiekontor has offered up to £1⁄2m for the village’s rail station project if their scheme is given the go-ahead, 93 per cent of local people have registered objections. The same developer has formally lodged an application with the county council to erect five 126.5m high turbines at Fenrother near Longhorsley. This has provoked fierce opposition from local people, with 1,000 letters of complaint. The developer, who is promising to pay up to £45,000 a year to a community fund, says that it has 329 letters of support, but the chairman of the Fight Fenrother and Longhorsley Windfarm Group, Dr James Lunn, has pointed out that these were standard letters which passers-by were asked to sign at a stall set up by aYorkshire- based eco-activist in Bridge Street, Morpeth – five miles south of Fenrother. In the same area, near Longhorsley, work has started on the first of two wind farms near Wingates, and other target sites have been identified at Todburn East and View Law. The rapid spread of wind farm schemes in Northumberland has been highlighted in maps compiled by Don Brownlow, who started up the www.windbyte.co.uk website in 2004 “because the public were being kept in the dark about the scale of the wind rush”. A member of a local response group which was opposing plans for the Moorsyde wind farm near Duddo, he said: “The website started off purely as a mapping exercise to show local wind farm applications in the North East and Lothian and South East Scotland. Then, when we eventually won our campaign against Moorsyde, it became more of a campaigning website. about the technology and its drawbacks the more anti we have become. “The county is under threat from reivers who now wear suits and are armed with laptops and document cases rather than spears and broadswords. But their intent is the same as the old border reivers: a quick killing, with no regard for the land, communities or people’s livelihoods. Despite the lucrative financial inducements offered by developers, leading Northumberland landowners and farmers are standing firm against the wind farm tide. These include not only the owners of some major rural estates such as the Duke of Northumberland, and the Ford & Etal and Lilburn estates, but also large numbers of smaller, less high-profile land owners. Frank and Clare Dakin, moved to a farm at Duddo, unaware that the area had been identified as ‘an area of search’ for wind development. They have rejected offers from developers which they have estimated would have earned them more than £200,000 a year for the next 20 or 25 years – as much as £6m – in order to protect the integrity of two sites of extreme historic importance on their land: the ancient Duddo Standing Stones and Duddo Tower. The new Environment Secretary, Owen Paterson, told the Conservative party conference in October that ‘Soviet-style green subsidies’ for wind farms must be scrapped because turbines were blighting local communities. He said: “There are significant impacts on the rural economy and the rural environment, all of which probably weren’t identified when these things were thought up.” Greg Barker, the Climate Change minister, promised that the government was dealing with the “never-ending gravy train of green subsidies”. Weeks later Energy Minister, John Hayes ordered a new analysis of the case for onshore wind power saying “We can no longer have wind turbines imposed on communities.” He indicated that only a minority of the thousands of wind turbines currently put forward for planning permission are likely to be given the go-ahead. refusal of applications which adversely affect the setting of heritage assets or recognised nature conservation features, and which would harm local tourism or recreation. ANDREW Joicey, a farmer near Cornhill whose land adjoins Ford and Etal Estates – a rural landscape rich with natural, historic and cultural features, and where many tourism- related businesses are situated – is an outspoken opponent of excessive and inappropriate wind farm development. A member of the Save Our Unspoilt Landscape group, and of other local opposition groups, he has been involved in opposing several major planning applications for large wind farms. Earlier this year he instigated a judicial review of three Northumberland County Council decisions to grant planning permission for three individual wind turbines in the north of the county which resulted in planning consent being revoked. The council accepted that it had failed to follow proper procedure in all 3 cases and Mr Joicey was awarded costs of £10,000. He said: “I have been campaigning for several years to try to prevent the unwelcome spread of wind turbines throughout Northumberland and the Borders, because I do not believe that they will deliver any benefits which would outweigh the unquestionable damage they will cause to some of the finest landscapes in Great Britain, not to mention stress to those living close to them. Wind power provides a very small, uncontrollably variable contribution to our electricity needs at a vast cost in terms of rising electricity bills for all consumers. “Investors in onshore wind farms, who include a great number of foreign companies, are simply chasing the spectacular profits while the costs to the consumer arising from the subsidy have been criticised by the Audit Office, the industry regulator OFGEM, and many economists and experts. “Income in the form of annual rent generated for farmers on whose land wind turbines are situated is extraordinarily high compared to any other form of land-based enterprise. But typically it only equates to between one and three per cent of the gross annual income earned by the wind farm itself. “Developers frequently make attractive looking financial offers to ‘the local community’ which take the form of promised annual cash payments, enhancement works to the local environment or improvements to community facilities. These are always very small in relation to the profits created by the wind farm, and insignificant compared to the much larger negative impact on the local economy through, for example, lack of confidence to invest in tourism facilities in a visually blighted area.